White Sulfur Springs artist retreat (Cabin 1) has electricity, heat, and access to a heated outhouse with a composting toilet ( The Outhouse has running water (during the winter months, it is winterized and water is only available in jugs for bathing (aka birdbaths). White Sulfur Springs Artist retreat is 90 minutes northwest of New York City in the beautiful Catskill Mountain Region of Upstate New York. The retreat is within a 10-minute drive to the incredible Peekamoose hiking trails and waterfalls as well as the Neversink Reservoir swimming area. The retreat has a kitchen with porch, made completely with re-purposed windows and shipping crates, is an oasis in the woods, a wonderful place to sit by the firepit, stay warm and cook (if you so desire). There are also other places on the property where campers can escape and make their own fire. Unlike more densely settled, gentrified areas outside the city, such as the Hudson River Valley or the Hamptons, this corner of Sullivan County feels lost in time, a cluster of tiny hamlets (like Roscoe, world famous for its fly fishing) that follow the twists and turns of the Delaware River. On the western edge of Sullivan County is the town of Jeffersonville, a place where you can find antiques and all sorts of oddities that feel like treasures lost in time. The towns of Livingston Manor and Callicoon, each less than 20 miles from one another, are attracting artists and entrepreneurs who are transforming these sleepy towns. During the winter the Catskill Mountains are transformed into a winter oasis where snow skiing, cross-country skiing, snowboarding, and snowmobiling take center stage. The White Sulfur Artist Retreat is a collaboration between artist Todd Monaghan, and designer Afsana Khundkar. Afsana Khundkar, educated at FIT, is a jewelry designer and avid antique collector. Todd Monaghan, educated at Emory University, is a renowned abstract expressionist painter known for embracing chance and recklessness abandonment. Todd Monaghan has practiced yoga and mindfulness for the better part of 30 years. The WSS Artist Retreat has been our family's ( we are parents of 3 boys ages 27, 19, and 14) refuge from the hustle and bustle of downtown New York City. The White Sulfur Springs (WSS) Artist Retreat embraces the concepts of sustainability, recycling, and educating others (especially children) on reuse, recycle and re-purposing materials in a creative environment that encourages collaboration and an exchange of ideas. The WSS Artist Retreat was designed and built as an example of Zero Carbon footprint living. We collected and recycled windows, doors and various other building materials from all over New York City (wall covering from dumpsters in the theatre district, windows and flooring from the Big Reuse and SOHO dumpsters). We encourage guests to engage in art-making, storytelling and the performing arts as a way to decompress and create/make in a stress-free environment. Our friends and guest enjoy the ongoing transformation of the property. Afsana and I chose this particular property for a number of reasons the first and foremost being its proximity to Manhattan. When we were first looking at the property we meet what would later become our neighbor who was a Brooklynite and longtime upstate summer resident. He spoke highly of the property, the fact that it was the last property on the street and because of this it was private and had no through traffic. We loved the fact that the property connected to state land directly behind it giving us even more room to roam. We also loved the fact that the property was bordered at the top of the hill to the east by an old stone wall. We loved the old growth trees, the wild blueberry, blackberry, and raspberry bushes. At 3 acres the property is not too big but not to small to manage to give us ample room to grow and expand as need be. The property and surrounding Forrest has ample room for hiking, bike riding, and cross-country skiing in the winter. There is also a steam nearby as well as a lake a short walking distance away We are a short distance from The Bethel Woods Center for Performing Arts (the actual site of the famed Woodstock concert) that hosts concerts and art events all year round. The Neversink reservoir and Peekamoose pass and trails are a short drive away and lead to the ski resorts on the other side of the Catskills State Park. There are ample restaurants, cafes, antique shops, and auction shops in the small towns close to our site as well as the newly added Sullivan County Las Vegas-style Casino a short drive away. Peace and quiet, Renew and recharge in nature Artist, designers and makers will be able to make and showcase their work. Bring culture Educate ETC. Please read about composting toilets here: https://natureshead.net/index.php Bring your own towels. During the winter months the outhouse is winterized. No running water. Water is provided in gallon jugs. Small electric kettle provided for heating up water as needed. Birdbath recommended. PLEASE LEAVE THINGS AS YOU FIND THEM. (ZERO CARBON FOOTPRINT). TAKE YOUR TRASH WITH YOU. New age beauty, health & wellness spa Yoga retreat & Buddhist temples are in the adjacent neighborhood for spiritual wellness. Rural and farmland all around yet only 2 hours from New York City. On the western edge of Sullivan County is the town of Jeffersonville, you can find stores filled with antiques and oddities the treasures lost in time. Sullivan Co. public golf course. Ski Resorts: Windham, Belaire, Hunter Located within 30 mins drive. Electric heat in the cabin for the winter weather. Floor lamp. Fan, No smoking. The kitchen has a wood burning stove to gather and cook. The covered porch is pleasant. Outdoor sink and a 5 - gallon water jug. Large cooler provided. Bring ice. Wood burning stove, fire pits and, gas grill to cook. Microwave in the kitchen house. Cast iron pots and pan to cook with. The camp kitchen is stocked with plates, cups, and utensils. Outdoor Kitchen. Picnic table, and fire pits to gather, prep, cook, and eat. Outdoor Kitchen, gas grill, picnic table, 5 gallon water pitcher+cooler, pots/pans/utensils provided. Feel free to bring your own plates+cups+ utensils, as well as ice. Collect your own firewood. Patio with the kitchen has seatings for eating and gathering. Multiple ski resort is in the Catskills region. 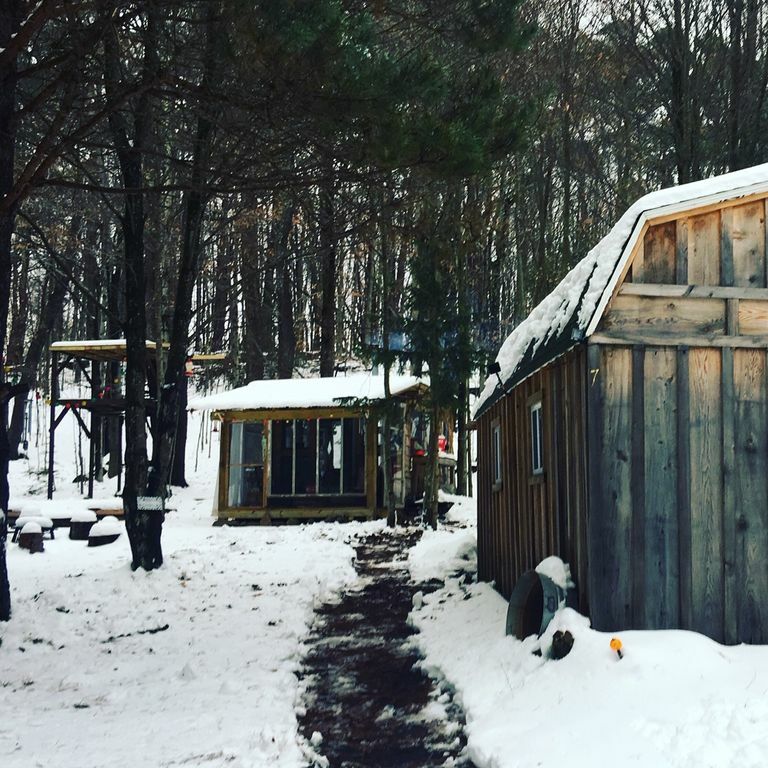 90 minutes from New York City, the White Sulfur Springs Artist Retreat is an oasis in the woods. A place to get away from it all, contemplate, relax and rejuvenate. Very beautiful cozy property incredibly inspiring for any artists. Afsana and Todd were incredibly accommodating, the entire property was very picturesque and serene I absolutely plan on returning. Thank you for staying at White Sulfur Springs Artist Retreat. You are welcome to stay with as again. stayed here for the night... was so quiet and the stars were beautiful. It's all beautiful. Despite the rain and the wind, the cabin was cozy and warm and snug . The outhouse was a revelation..hot water and composting toilet and comfort in the woods. And rescuing my drone from the trees. well, I love this place! Had a really great time! Definitely would recommend! The property was beautiful, it was soo nice, we really enjoyed it. The hosts were great, so welcoming. The location was very pretty. They have everything you need at the site, you get the feeling of being out in the woods but also enough amenities to feel comfortable. Loved the experience and would definitely recommend it!